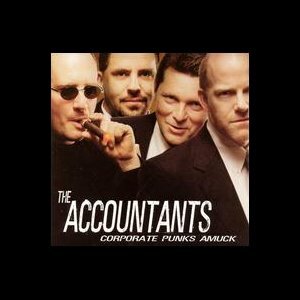 The Accountants – Corporate Punks Amuck | NoCoda. What It Sounds Like: Ramones-inspired guitar rock, all about the grueling nine-to-five, workin’ for the man, get me outta this cubicle lifestyle. The Accountants are a novelty act. That may sound disrespectful, but even these guys have to know – it’s true. Band’s all have a shtick, and these guys are all about the suit-and-tie professionals by day, rock ‘n’ roll stars by night routine. As Mr. Seinfeld would say – “Not that there’s anything wrong with that!” Sure, they gained attention around their local scene – they’re unique! – and they very well could probably make a decent living traveling around, playing at various corporate events. It’s not a bad idea at all! Find a gap in the industry – a unique niche – and fill it. These guys did! Play some rock and roll! Could this chick be the next Bill Gates? I don’t think The Accountants have any desire to rule the charts. They like coming home to their wife and kids. They don’t want to tour for endless weeks. They want to work their jobs, play some gigs when they can at Christmas parties and event launches, and bring some joy to the monotony of every day life that may be easy to get stuck in. Now look – do I want to listen to it all the time? Absolutely not. Is there a time and place? Like most things in life, of course there is. Try your very best not to lose it when they starting singing the most sexualized song about a personal digital assistant (or, PDA) that you’ve ever heard in your life. Probably, in fact, the only song you’ve ever heard about a PDA in your life! This is something that would very easy to hate. If the idea of what they are doing sounds completely stupid to you, then simply walk away. There’s nothing for you here. But if you just take it at face value for exactly what it is, you’ll be able to find some enjoyment here.